Did you know that potentially 1 out of 10 people have a sulfite allergy? My great friend Michelle and I both suffer from migraines and know that sulfites can be triggers for migraines. Aside from being a migraine sufferer, my pal Michelle also is very picky about what adult beverages she likes...as in...only drinks tequila or my secret family recipe for "Mollie B. 's Homemade Bailey's". 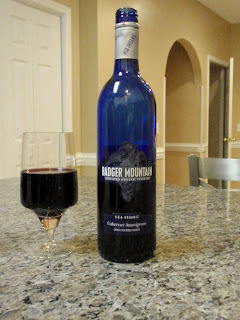 But, she tried the Badger Mountain Vineyard NSA (No Sulfite Added) Organic wine and was quite happy. We shared some of the Chardonnay, which by the way, is the most delicious Chardonnay I have ever had. And for only $10.00 a bottle, this is quite a steal too! The Merlot and Cabernet Sauvignon were also delicious. These wines are USDA Organic & although a natural amount of sulfites do exist in wine, these wines have no added sulfites which can really ease the mind of someone who is sensitive to sulfites. The Badger Mountain Vineyard is based out of Washington State and they put a lot of passion into their wine, which is reflected in its quality and taste. Please consider these wines when making your next purchase for a dinner party, romantic night in, or for a gift! You will not be disappointed. Thank you so much to Badger Mountain Vineyards for letting me try your wonderful wine!